There's a new interface for Google Tasks, the experiment initially launched as part of Gmail Labs. Now you can view and edit your tasks on an iPhone by visiting http://mail.google.com/tasks/iphone (a shorter URL: gmail.com/tasks). Google also launched an iGoogle gadget that provides similar functionality. The gadget is only a wrapper for the standalone version available at http://mail.google.com/tasks/ig, a page you can bookmark or add it to your sidebar in browsers that support this feature (Firefox, Opera). Gmail Blog explains that the most important competitor for Google Tasks is paper (I remember a similar statement regarding Google Calendar). "Among the world's leading productivity tools is an advanced technology known as paper. Many of the world's top corporations and most active internet users have adopted paper as a method of organizing their daily lives. (...) When we set out to build Tasks (now in Gmail Labs), one of our goals was to improve upon paper. 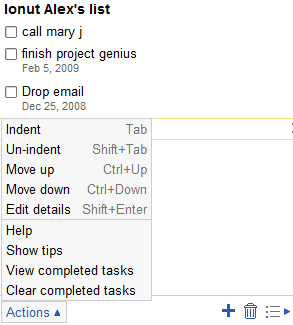 With the version of Tasks in Gmail, we focused on making editing very fast and simple -- as close to paper as we could." Hopefully the next iterations will bring a proper standalone version, the integration with Google Calendar and an API that will facilitate synchronization with other applications. That will give Google Tasks competitive edge over paper. Doesn't seem to work (as of this moment) with google apps. I have tried to type http://mail.google.com/a/[mydomain.com]/tasks/iphone, but google just sends me back to the inbox view. it useful for iGoogle, Start Page and Sites. The iGoogle widget doesn't let you select between lists, for those who have more than one. This is a dumb limitation. Also, it's fine to make jokes about paper, but as far as I can tell, this is way more limited than paper. Given the sophisticated task managers that are out there, is this the best Google can come up with? http://mail.google.com/tasks/a/yourdomain.com doesn't work, for the record. It just bounces to http://mail.google.com/mail/help/tasks/. The shorter URL works only on the iPhone because Google checks the user-agent. Yep, definitely better than paper. Paper always beats out anything without an API! Paper I can shove in my pocket next to my Blackberry. If there's no API then there's no sync'ing to the Bb so no carrying it with me, so way too limited. I'll mess around with Tasks but I won't get serious until I can sync them. Don't forget that with the standalone url (http://mail.google.com/tasks/ig) Chrome lets you create a separate desktop app. It's convenient to use paper, but it's not searchable, it can't notify you about the tasks you need perform, it's not password-protected and you can easily lose it. Don't forget Remember the Milk as a competitor... I still think it's better than Tasks. And it integrates with Gmail! Yup...Remember The Milk still wins my vote. I've been hoping for a Google Task tool for years...but I won't make the switch until the tasks can be made to repeat, and work as an offline app on my iPhone. Does (or will) it have webcal feed? Does anybody know? http://mail.google.com/tasks/a/yourdomain.com/android does work on Android. I made an app for Android (Tag-ToDo-List) and people have been asking me for synchronization with an online service for quite a while. A Tasks API would be a great opportunity for that. I had to enable Google Labs from the Google Apps Admin page and then restart my browser to enable tasks in my individual settings page. Tasks in Safari and Firefox now work, but the iphone is still giving me the redirect and goanna_mobile error. is there a mobile version of Google Tasks? I use Google Notebook instead, but I found out tasks much more easier so I moved all my tasks . But I'm not able to reach the tasks using my mobile phone. Is there any java application or mobile interface using easy html code that my mobile would understand? Is it possible to build a full-screen mode for iPhone? The full-screen mode webapp is working very good on iPhone. I think Google's tasks ap is so lame I'm thinking of returning to Outlook. For God's sake, Outlook had regular task functions from the beginning, integrated with the calendar, where it should be. And, you can sync with your phone. What good is a task list that I can't get to my phone? If Microsoft produced such garbage, you'd never hear the end of it. I can't get google task to work right in IGoogle. It keeps saying there was an error and to restart.I use FF and vista prem. Another laptop with XP works fine. What's up? jmyers8888 - I sync my Outlook contacts and calendar with my iPhone but as far as I know, Tasks do not sync. I like this in theory, but is there any chance of an App so that I can add/remove tasks offline too? I just began using this, so I can't say yet whether I like it or not. It seems like a helpful tool. But one of the reasons I like to use paper is because I can flip back through my handwritten task book for a specific piece of info. For this app, it would be great for completed tasks to go to a history list where the dates of task input, notes, and completion are kept. Right now, it just looks like tasks are crossed off when completed, and if you 'clear the list' it goes away forever. Task history, including dates and notes would be fantastic. Needs to integrate with Calendar so it will remind you to do XYZ. Otherwise, it is useless to me. I need to by able to synch it with my phone for offline use. So far, it is worse than paper because it takes longer to write down. For tasks in Calendar, I enter an all-day appointment on the day the task begins and extend it until the day the task is due. That way, tasks always appear at the top of the day's events. When you complete the task, just delete the appointment. Try it! Might not work if you have a great many all-day appointments, but it works for me. Is there a desktop gadget? I made a "app" button for the Google Tasks by clicking the plus sign and then add to home screen... it's not as great as an app since it takes a little bit of time to "download" but works good enough for now. Has anyone figured out how to make this work with a Google Apps account? I'm still getting the goanna_mobile error. It works fine on my Google apps account. I guess the natural progression from here would be to be able to assign tasks to others in the same apps domain. Or if Google can provide APIs to tasks, someone will build it. In here Check "Enable pre-release features"
"We're sorry, your domain does not appear to support features such as the stand-alone version of Tasks"
to displaying the iphone mobile safari google tasks interface correctly. Check out GeeTasks - online/offline iPhone client for Google Tasks. Ideal for iTouch users. Is there no way to (un)indent tasks on the iphone version? can I use google tasks offline the same as the mail app on the touch and iphone as I don't alway have wifi connection? No, at least not if you use Google's mobile interface. There's a third-part app at http://www.geetasks.com/ that promises to solve your problem. Unfortunately, it costs $3. I wasted my money on a non-working app. The Geetask login issues were prevasive enough that the app store has suspended sales. Maybe the developer will get his act together. GeeTasks is back in store, login problems were solved over a month ago. 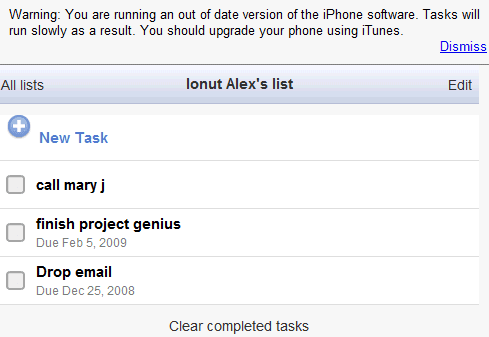 So far, I like having my Tasks available on my iPhone, but....I wish I sould sort by due date on the iPhone. Works great on the laptop and in iGoogle, but no luck finding out how to do this on the iPhone. If anybody figured this out, please post the steps. Thanks! Geetasks has free option! thanks for the tip! I also found "gTasks" for iPhone which synchronizes with Google's tasks and has nice, clean user interface. On my iPhone 4S in Safari the Google iPhone-specific Tasks seems stable and highly functional and intuitive UI as on the laptop ... But I can't rearrange the blasted list members. Also I wish Google would generalize tasks to have more than a single indent layer and make the items with sub-items collapsible. I really don't know how you got that icon for the home screen shortcut. All I get is a tiny screenshot of the page and I hate that. Even though HTML 5 is not yet popular, HTML 5 linked with the modern technologies may bring about powerful results.